On Friday 27th April, Wolverhampton’s Ivor Novello award winning songwriter, Scott Matthews, is set to release his sixth studio album, The Great Untold – out via Shedio Records. Scott Matthews will be also performing at St Paul’s Church in Birmingham on Sunday 20th May, as part of The Great Untold UK Tour – as presented by Moseley Folk. For online ticket sales from Skiddle, click here. Recorded over a winter spent at home, The Great Untold is very much a milestone for Matthews and sees him starting a new chapter in life as a married man and soon to be father. Title track, ‘The Great Untold’, opens the album with a tender, intimate affair between Matthews’ soft vocal and guitar intricacies. 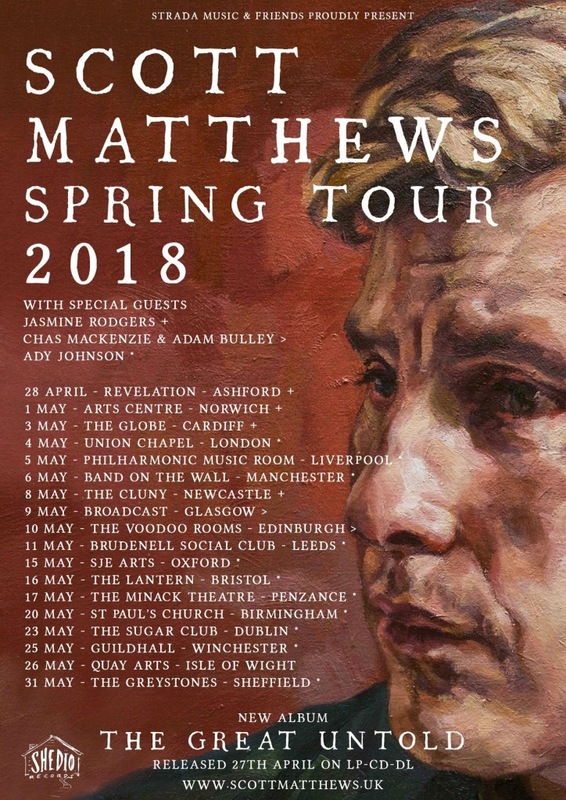 Accompanied by nothing more than flourishes of piano, it certainly sets the tone; Matthews goes back to his roots as an acoustic act, with inspirations such as Tim Buckley and Nick Drake ringing through loud and clear. ‘As the Day Passes’ also puts Matthews’ stunning vocal delivery at its forefront; with a lullaby like piano outro, and soothing picked Spanish guitar part that harks influence from world music, it’s the kind of song you would expect to hear in a Wes Anderson film. The hazy vocals of ‘Silence’ create the atmosphere of a summer’s evening. The chorus sees Matthews muse, “Silence, nothing’s complicated in my solitude, where I can hear myself…” in a statement that confirms his re-kindled solace as an acoustic artist, away from his full band environment. ‘Something Real’ is euphoric and joyous in its musical arrangement, with bold acoustic guitars providing a counterpoint for Matthews’ vocal powerhouse. His mastery of melody and harmony is at the forefront of this track and it would be no surprise to find this particular gem as a Jeff Buckley B-side, its ringing guitars and soaring vocal falsetto harking back to Buckley’s iconic Grace album. The same goes for The Great Untold’s lead single, ‘Cinnamon’; subtle soundscapes and drone like vocal delivery create an atmosphere that creates imagery of the time in which the album was conceived. Tracks such as ‘Goodnight Day’ and ‘A Song to a Wallflower’ particularly stand out for me and help to diversify the album, which dare I say is needed at times. ‘Goodnight Day’ shows a darker side Matthews’ songwriting; a Gold era Ryan Adams-esque ballad, Matthews is accompanied by a choir of vocal harmonies in this big screen noughties film soundtrack worthy affair. Whilst the steady beat of ‘A Song to a Wallflower’ sounds as if it came straight from the Help soundtrack, with strummed acoustic guitars and Beatles bass sound it could easily have been penned by Lennon and Mcartney. The album closers, ‘Daydreamer’ and ‘Chapters’, take us back to the place where it began, merely an acoustic guitar and Matthews’ tender vocal delivery. Despite its thin instrumental textures, The Great Untold is still every bit as captivating as Matthews’ 2001 debut album, Passing Stranger – a yardstick the artist has arguably been judged by since its release. But the lack of percussion on The Great Untold is perfectly subsidised by Matthews’ vocal talent, providing plenty of melodies, highs and lows to keep the listener hooked. You could further suggest that the largely acoustic sound of The Great Untold encourages the best from the songwriter’s voice and instrumental prowess, as heard on 6 minute epic ‘Lawless Stars’. A combination of moody reverberating guitars accompany Matthews’ blanket of choir like vocal harmonies, seeing the songwriter make the most of the most of his natural vocal gift. The track is a journey, building into a crescendo of guitars and voice before it fades into an instrumental section containing just a slide guitar part – a nod, once again, to Matthews’ Bert Jansch influence. Although an album of beauty, for me The Great Untold stays a little too much within its seemingly set format of acoustic guitar and vocals, lacking the raunchy guitars and primal beats that can be found in Matthews’ wider portfolio. But as a relatively new listener to Scott Matthews, this latest album did not disappoint – showcasing his songwriting talent and ability to write catchy melodies that do not conform to the typical songwriter style. And in a time of overdressed pop production, an album that often contains just a voice and a singular instrument is especially refreshing. 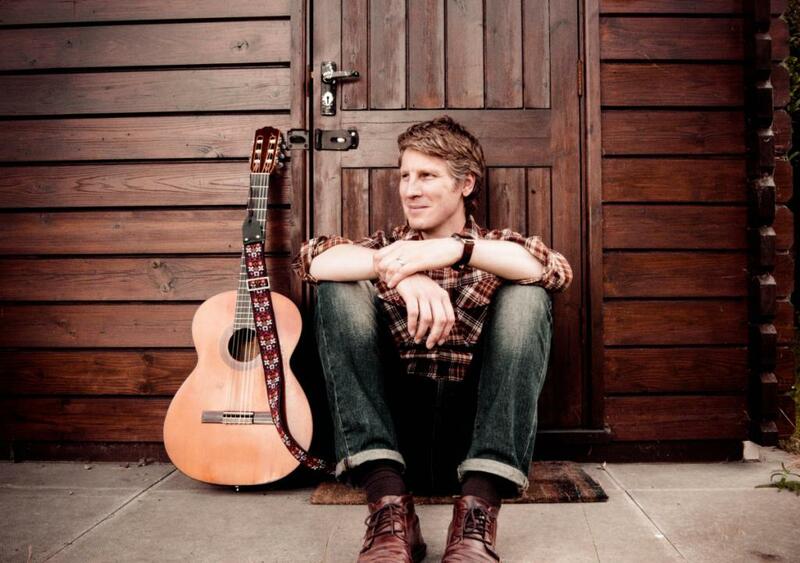 Scott Matthews will be performing at St Paul’s Church in Birmingham on Sunday 20th May – as presented by Moseley Folk. For online ticket sales from Skiddle, click here.